The construction industry is expected to experience a significant amount of employment growth over the next decade, according to new projections from the Bureau of Labor Statistics (BLS). The BLS employment projections are designed to estimate labor market changes given assumptions and estimates involving structural economic factors. The estimates assume full employment and do not attempt to estimate cyclical or business cycle effects. The current edition of the BLS employment projections covers the 2014-2024 period. 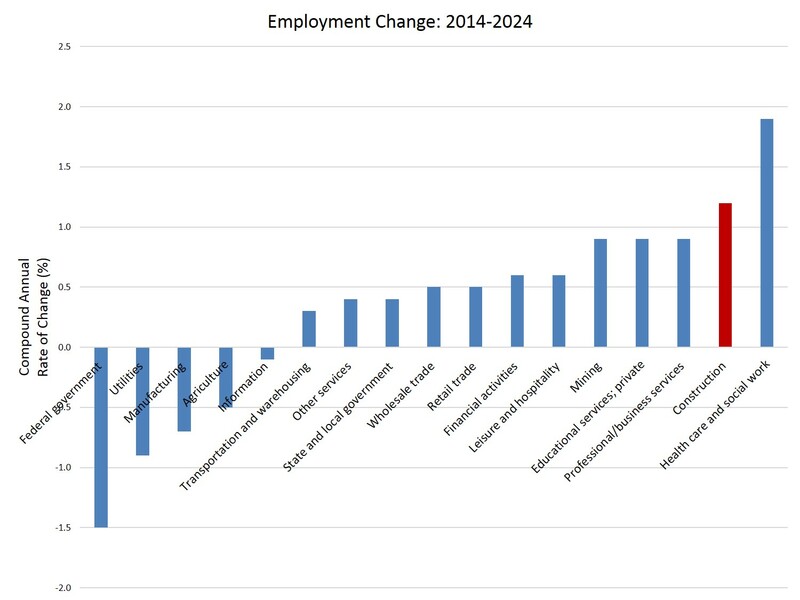 According to the BLS, the construction sector is expected to add 790,400 jobs through 2024. This places the construction sector fourth among major industries. The health and social assistance sector leads with a forecasted 3.8 million job gain, followed by professional and business services (1.9 million) and the leisure and hospitality sector (941,200). In percentage terms, the construction sector ranks second in terms of expected growth. The construction industry is expected to experience 1.2% compounded annual growth for jobs over 2014-2024. Only the health and social assistance industry (1.9%) exceeds this growth rate. It is worth noting that the BLS projections for construction do not lift employment above the total measured for 2004. Over the 2004-2014 period, 837,800 construction jobs were lost on a net basis, a larger number than the expected 2014-2024 gain. The projections utilize a number of structural variables regarding the future growth of the economy. With respect to construction activity, the BLS models residential fixed investment as growing at a 3.7% annual rate, with 7.7% for single-family and 2.2% for multifamily. Nonresidential structure investment is modeled as growing at an annual 3% rate. The BLS report provides additional detail at the occupation level of analysis for the 2014-2024 period. Within the construction worker occupation, the top growing jobs include solar photovoltaic installers (24.3% total growth over ten years), iron/rebar workers (23.4%), insulation workers (19.4%), brickmasons and blockmasons (17.9%), electricians (13.7%), and earth drillers (13.6%). In terms of total construction and extraction occupational employment across all industries, employment is expected to grow by 659,000 (10.1%). However, total job openings over this period are expected to total 1,682,200 due to both net growth (the 659,000 from above) and replacement needs for workers leaving the industry. Among other real estate-related occupations over the 2014-2024 period, the BLS report forecasts net job growth of 349,800 (6.2%) for building and grounds maintenance occupations, 25,300 (8.1%) for property and real estate managers, 9,000 (6.7%) for architects, 2,200 (3.8%) for interior designers, and 10,900 (2.6%) for real estate brokers and sales agents…and growth of 1,200 (5.7%) for economists.